Renowned physicist Stephen Hawking has some new theories on black holes, including the possibility they exit to alternate dimensions. 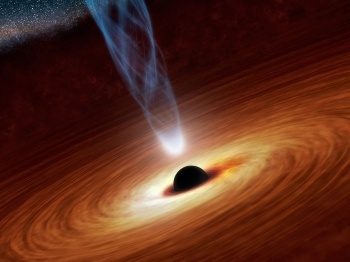 Few stellar bodies have captured the public imagination - or confounded scientists - quite like black holes. Even Stephen Hawking himself noted our models of physics can't quite explain how they operate, since anything that falls into one can't simply disappear into infinity. In response, Hawking has generated a new theory presented at the Hawking Radiation conference, and his answers will delight physicists and sci-fi fans alike. In short: Black holes don't destroy physical information but store it as holograms, and might eventually send it to another dimension. The basis for Hawking's theory lies in the laws of quantum mechanics, which state everything is encoded with quantum mechanical information. This information can never be destroyed, even if it's sucked into the maw of a black hole. Yet from all outward appearances, that's what seems to happen. To solve the conflict, Hawking proposes this information never reaches the black hole at all. Rather, it's encoded into a 2D hologram called a super translation on the event horizon, which is emitted as quantum fluctuations. "The information is not stored in the interior of the black hole as one might expect, but in its boundary," Hawking said. "The idea is the super translations are a hologram of the ingoing particles ... Thus they contain all the information that would otherwise be lost." Hawking does admit that for practical purposes, any information in this state is lost to our universe. But at the same time, he adds it's possible for physical matter undergoing this process to eventually emerge in another universe. "The existence of alternative histories with black holes suggests this might be possible," he continues. "The hole would need to be large and if it was rotating it might have a passage to another universe. "But you couldn't come back to our universe. So although I'm keen on space flight, I'm not going to try that."